A GHOSTLY ENCOUNTER AT "THE WINDING HOLE?" NIGHT fishing can be an un-nerving experience at the best of times, especially when you are only thirteen or fourteen years of age. 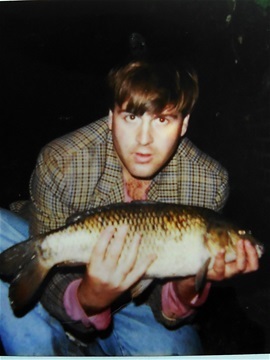 It was the late Seventies and I was fishing a wide area of the Stourbridge Canal. It was “a winding hole”, where barges would turn round in bygone years. By then, it had silted up considerably and there were reed and lily beds along the far margins, in the shadow of tall old poplar trees that seemed to lean against each other for support. As I recall, a full moon rose above the poplars, a harvest moon no doubt, because it was late August. Clouds drifted across it and the night became very dark and almost silent, expect for the occasion flip-flop splashes of small roach on the surface. It was cold too, during those quiet early hours at the very edge of autumn. Already a few leaves had fallen. There had been a still, melancholy atmosphere to the evening and I felt forlorn and lost at times, sitting there in the chill alongside a fishing friend, called Martin. Martin was slightly younger than me; - he must have been only 12 or 13, and it is astonishing to reflect that our parents allowed us to go night fishing at all. However, the late Seventies was a different country, and permission had been granted. The canal had just been stocked with carp, and there were one or two old, established carp swimming around there as well. On previous day outings, we had managed to catch a few very small carp – our first ever; but my elder brother David’s night sessions had led to captures of decent eels, slightly larger carp and even a rare canal tench; and so we fished on in hope. The rats were rustling in the hawthorn hedgerows behind us and the hours dragged on, dragged on uneventfully, with our silver paper indicators refusing to lift one inch. Sure enough, we could see a lit cigarette, - a red spot of heat burning in the darkness. It was bobbing along with the brisk steps of its holder, at about waist height. “Who is it?” said Martin. No reply came; and the figure, a dark silhouette of a man and the red spot of light, was now only about ten yards away. The figure stopped, - its back against the hawthorn hedge, the cigarette still held low, as if a man was lost in thought, pondering his next move. “Who’s there?” asked Martin. His voice hadn’t broken. It was a nervous, high voice. Still, no reply came. All we could still see was the dark shape of the stranger and his burning cigarette. I’m still not proud of that threat, - but in fact I didn’t have a knife, I had a pair of open artery forceps in my hand and I clicked them shut, to create – I hoped – the sound of an opening flick knife. The forceps were there, of course, for unhooking purposes. My threat seemed to work; - but here is the strangest thing, because we did not see the smoker turn and go and we heard nothing; - but we noticed the man’s red cigarette bobbing over the open fields behind us, - moving away, bobbing away, until it was visible no more. Somehow, he had managed to pass through a hawthorn hedge and a barbed wire fence in total silence! Odd to relate, we had never been really terrified; we were merely relieved that he had gone. In the daylight, in a grey autumnal dawn, we were busy unhooking an eel I had just landed and all thoughts of the stranger left us for a while. But we couldn’t help looking at the hedgerow behind us, and the barbed wire fence, and we started to wonder if our night-time visitor had been flesh and blood at all, despite his burning cigarette and the dark silhouette of his brooding shape. Pictured above - the Gnome with a typical, small canal common, from the Eighties. Werewolfs have been known to have a Ciggy Before/after a Kill. I suppose it helps them to relax? True, Cole55 - but how to you explain the burning cigarette etc? Would that be Martin? Get in touch, you old sod. Pass the loo roll moment ! I recon I still have the eel photo ......terry Thomas who ?